Other Notes: Ruggedly constructed metal surface mount cabinet, optional alarm or alarm & strobe available. Made in the USA! 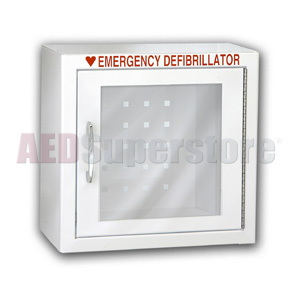 AED Wall Cabinet. This ruggedly constructed metal surface mount cabinet is the right size for smaller devices like the Welch Allyn® AED 10™. Optional door-activated alarm and optional flashing strobe light that alert everyone the AED has been deployed for rescue. Strobe light adds 3" to cabinet height.